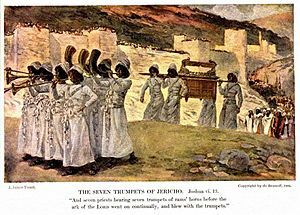 “So it was, when Joshua had spoken to the people, that the seven priests bearing the seven trumpets of rams’ horns before the LORD advanced and blew the trumpets, and the ark of the covenant of the LORD followed them” (Joshua 6.8). Joshua heard from the Lord, and the people accepted that the Lord had spoken to Joshua, and when they did as Joshua said, and the walls came down, they could know that the Lord had spoken through Joshua. Therefore, the seven priests bore seven rams’ horns trumpets, and blew in them at the appropriate time. Imagine being one of those priests, knowing that you have in your hand such a trumpet and that when you make a blast with it, the walls of a city will come tumbling down! This entry was posted in Joshua, Seven and tagged ark of the covenant, Book of Joshua, God, Israel, jericho, Joshua, Joshua 6.87, Lord, seven in the Bible, sevens in the Bible, Trumpet. Bookmark the permalink.